There is growing concern about an AI-driven future in which there aren’t enough jobs to go around. Not just a shortage of good jobs, mind you, but a shortage of jobs, period. A swelling chorus of economists and other experts foresee a future in which highly-skilled, well-paid jobs exist only for a shrinking minority. For everyone else, there will be low-skilled, poorly-paid jobs for some, and no jobs at all for an ever-larger portion of the population. This idea was argued persuasively a few years ago in the book, The Second Machine Age, by MIT professors Erik Brynjolfsson and Andrew McAfee. They wrote that the first machine age replaced muscle power with machine power, especially as a result of James Watts’ steam engine. The long-term effect was that more and more individuals were hired for their brains instead — as workers in the new knowledge economy. Now, however, we are well into a second machine age, this one a digital revolution in which it’s brain power that is being replaced. As a result, we now face a frightening question: What happens when machines are better and cheaper, than humans at many of the ‘brain’ jobs as well? Far-fetched? Not according to Brynjolfsson and McAfee, whose book details how thoroughly AI-empowered computers and robots are invading the knowledge jobs that were once considered the exclusive province of humans. 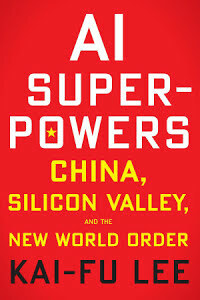 Recently, the job-loss alarm has been sounded more emphatically still by Kai-Fu Lee in his book AI Superpowers. Lee is eminently qualified to assess the current state of artificial intelligence and where it’s going. Lee got his AI start as a Ph.D. student at Carnegie Mellon, followed by executive positions at Microsoft, SGI, and Apple, eventually becoming the founding president of Google China. Then in 2009, he launched Sinovation, a VC firm focused primarily on China’s AI entrepreneurs. He was selected as one of the 100 most influential people in the world by Time magazine in 2013. Presumably, Jesus’ business owner is not only generous, but he’s also prudent. He knows full well that he cannot employ so many workers, nor pay them so bountifully, that his business becomes unprofitable and fails. After all, should that happen the number of people he can employ falls to zero.